Systems Dynamics is a discipline that floats about in the management science/management consulting ecosystem. It is genetically related to Systems Thinking, though Systems Thinking contains much more, but no aspect of simulation. The two most important aspects of Systems Dynamics are influence/causal diagrams and continuous simulation. Today I would like to outline an example of the use of influence diagrams to study a simple system, gain strategic insight, and form the basis of a stock and flow continuous simulation. I was in Paris the other weekend, looking for a restaurant for Sunday lunch. Finding a good restaurant as a tourist is always difficult because tourist restaurants just aren't very good. The restaurants in my neighbourhood in London rely a lot on repeat business and referrals from friends and engage in a repeated interaction with their customers. The restaurants in touristy areas on the other hand get the majority of their business based on location. My local restaurant wants to delivery value for money so that I or my friends will come again. The restaurant in Venice never expects to see me again and is motivated to give me the lowest value for money to maximize profit. We have an example here of repeated and non-repeated games, but this is not an article about game theory. As regular travellers, we have a strategy for finding the right place. There are a number of aspects to that strategy, but the one I want to highlight today is: Find busy restaurants. We are by no means the only people employing this strategy, as it is clear that busyness should be an indication of quality. As the "Length of Queue for Seating" increases people will be discouraged and it will reduce the number of "New Customers Arriving"
Re-enforcing loops can be exploited to achieve exponential growth and profit, but can also cause exponential collapse and bankruptcy. Balancing loops are often related to limited resources which limit what we can achieve, but also serve to mitigate damage. 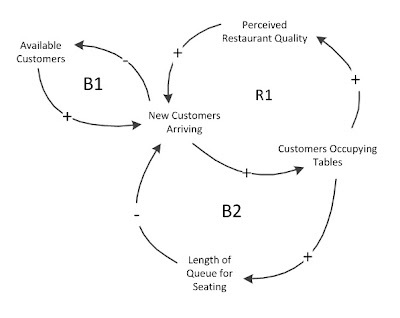 Loop B1 is a balancing loop: As more customers choose to enter our restaurant, the total number of potential customers is diminished, thus reducing the flow of new customers. This puts a natural limit on our business, the number of potential customers. 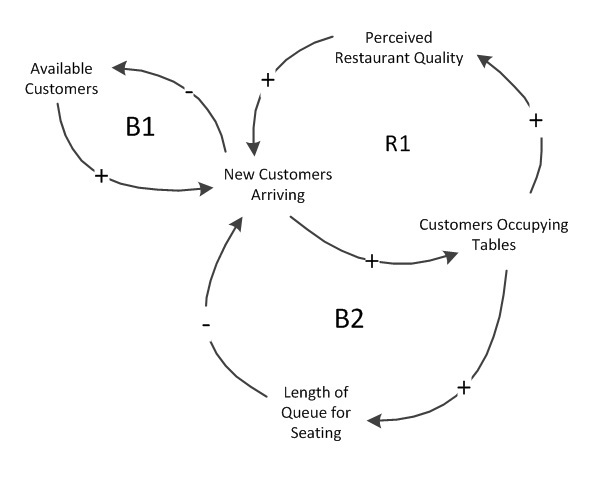 Loop B2 is a balancing loop: As more customers arrive, our tables experience a higher and higher occupancy and customers must wait in a queue either for other customers to leave or for dirty tables to be turned over. Here is another resource constraint on our system: capacity. Loop R1 is a re-enforcing loop: More customers leads to an increased perception of quality which then leads to more customers. This is they key re-enforcing loop that we should study further. The key strategic conclusion that can be drawn form studying this influence diagram comes out of loop R1, the re-enforcing loop. The consequence of this loop is that full restaurants tend to stay full and empty restaurants tend to stay empty. Given that each restaurant starts empty each day, the key challenge appears to be in first becoming not empty. Easier said than done. Restaurants and bars have a number of ways of achieving this. The first, but least interesting, is simply good quality. A regular customer base or recommendations in guide books will provide the seed customers from which a full house can grow. Alternatively, we need some other means of getting people in the door. This makes me think of my time in Turkey on the Mediterranean coast. Walking along the waterfront in a tourist town, a restaurant owner offered me a half-priced beer as long as I would sit along the front edge of his balcony. If this makes you think of happy hour there's probably a good reason. I will admit that the "strategic insights" discussed above with respect to the restaurant industry are not earth moving, profound, or even unexpected. However, this article provides a simple real-world example of a dynamic system, and demonstrates the concept nicely. Had we not already known that full restaurants stay full and empty restaurants stay empty, going through this exercise could have revealed that to us. The next step would be to design a simulation based on the influence diagram, something that I will endeavour to do in a future article. Starting up in Operational Research: What Programming Languages Should I Learn? INFORMS 2016 has begun - I am guest blogging for the INFORMS Conference in Nashville. See my first post on the new INFORMS logo and website.